Has Mindfulness Become the New Kale? Science backs it as more than the latest trendy self-help strategy. Jackie drops her kindergartener Lexi at school, where the five-year-old starts her day on her mat, listening to her teacher read Sitting Still Like a Frog: Mindfulness Exercises for Kids. She passes by a bookstore cluttered with mindfulness coloring books on her way to work. There, the lunch-and-learn session of the day is Mindfulness: How to Cultivate Presence Amidst Your Busy Workday (she’s too busy to attend). Later that night, her wife, Peggy, comes home gushing over NPR’s story on Buddhist monk Haemin Sunin’s promotion of peace and mindfulness via Twitter, of all places. As Jackie curls up into bed, she flips through the special “Mindfulness” edition of TIME magazine she bought a few months back (but was too busy to read). Mindfulness is the latest sensation that’s become as mainstream as sushi and as popular as kale. No longer reserved for kombucha-drinking, fire-walking, zen-zealot types, the 2,600+-year-old teachings from Buddhist traditions have become a hot commodity, generating over $4 billion in sales in 2016. There were 12 million adult coloring books, 100,000 mindfulness books and 700-plus new apps sold to help us eat, walk, commute, and work a little more mindfully. Entrepreneurs are using it as a success hack, companies are forking over big bucks to set up quiet spaces, and schools are building mindful moments into classroom routines. It’s a BORDERLINE.MIRACLE. that an antidote for modern living that requires OUR. ATTENTION. has actually gained so much traction. Does this mean it works? Or that we NEED.IT? Research says BOTH. Our overstimulated brains take in the equivalent of 174 newspapers a day. We walk around on the verge of frying our motherboards. Most of us are skeptical enough to balk in the face of five-cent self-help strategies that pretend bandwagons and drive-thru options for relief will get us anywhere except down the same path of constant stimulation and reactivity that begged us to be more mindful in the first place. We’re smart (and exhausted) enough to know we need scientific proof if we’re going to add something onto our already full plates. Just as kale is a superfood for the body, mindfulness offers well-documented benefits for the mind. By definition, mindfulness is a state of active consciousness that helps us observe, acknowledge, and accept feelings, thoughts and bodily sensations without judgment. It can help us relish in positive states and experiences and tolerate unpleasant ones. It helps us clear some room for our brains to flourish, instead of being sucked into the vortex of 24-7 hyper-performance our culture serves up. Mindfulness has empirically supported benefits like fewer depressive symptoms, increased focus, and better moods. 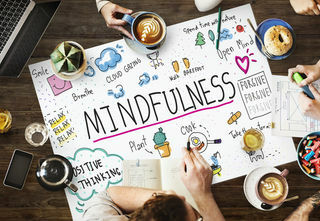 In a meta-analysis of mindfulness interventions, mindfulness was shown to boost cognitive agility and adaptive responses to stressful situations. 1. Get comfy with discomfort. This aspect of mindfulness, often called “radical acceptance,” isn’t the most palatable, but is an essential ingredient. We have serious aversions to discomfort—it’s part of our culture and primitive instincts. We’re the most medicated, obese, addicted group ever. We’re known for our numbing and running away tactics. Despite best intentions to binge and purge on the chaos buffet of life, our attempts to dodge it all together can create more distress. As M. Scott Peck said, “Once we know that life is difficult—once we truly understand and accept it—then life is no longer difficult. This doesn’t mean we must quickly digest whatever life is shoving down our throats. It means that we work towards adopting a mindset that expects hard moments to be dished up, but remember we’re capable of moving beyond them. Shift happens. 2. Put judgy away. A non-judgmental stance—one that allows us to observe thoughts without instant condemnation is another way to counteract the high doses of overstimulation we’re fed in this hyper-competitive market. Laying down mindless hyper-vigilance and instead of looking at the bigger context and how it’s affecting behavior is a pathway to greater self-compassion and mindful living. Constant judgment can lead to self-sabotaging beliefs and behaviors. Mindfulness allows us to practice greater self-compassion and better meta-awareness (the ability to monitor and regulate thoughts and emotions). Rethink your gut instincts to judge. 3. Change your mental diet. Are you feeding off of perfectionistic and imposter thoughts, the kind that tells you that despite EVERYTHING.YOU.DO., it’s NEVER. ENOUGH? Are your attempts to boost your identity and self-worth with busyness and status becoming like empty calories, instead of ones that value presence over performance? See what kinds of tasks you can remove or delegate from your plate in order to feast on more balanced expectations of yourself. We are human beings, not doings. Will mindfulness become more than your new kale? Research shows we need it and it and it works. How will you readjust your plate to make room for radical acceptance, a non-judgmental stance, and to resist the compulsions towards binging and purging on hyper-performance? Try to adopt a daily nourishing mental diet so you can flourish, and avoid having mindfulness become just another fad that falls by the wayside.